When an athlete rises to fame and hits celebrity status, an opportunity presents itself to cash in on the success. The bigger the star, the bigger payday. Though some are quick to call an athlete a sellout for endorsing any product thrown their way, it’s hard to knock anyone for taking advantage of great deal. That being said, these athletes must have been paid unimaginable sums, because these endorsements are just plain weird. Well, anyone purchasing ‘Unbreakable Bond by Khloe and Lamar’ never has to worry about such a thing, because two-time NBA champion Lamar Odom (and Khloe Kardashian) is backing the product. This perfume, launched in 2011, has got some major problems that are so bad it’s hard not to find it amazing. Let’s jump right to the biggest problem: ‘Unbreakable Bond’ is a fragrance endorsed by a couple that broke up. Woof. Talk about false advertising. If that sort of information feels like it’s crossing a line into their personal lives, just take a look at the upper left picture of Khloe. Seems they’re plenty willing to reveal TMI about their relationship already. Arguably at the peak of his performance, Spanish striker Fernando Torres was one of the best strikers in the world while playing for Liverpool from 2007-11. 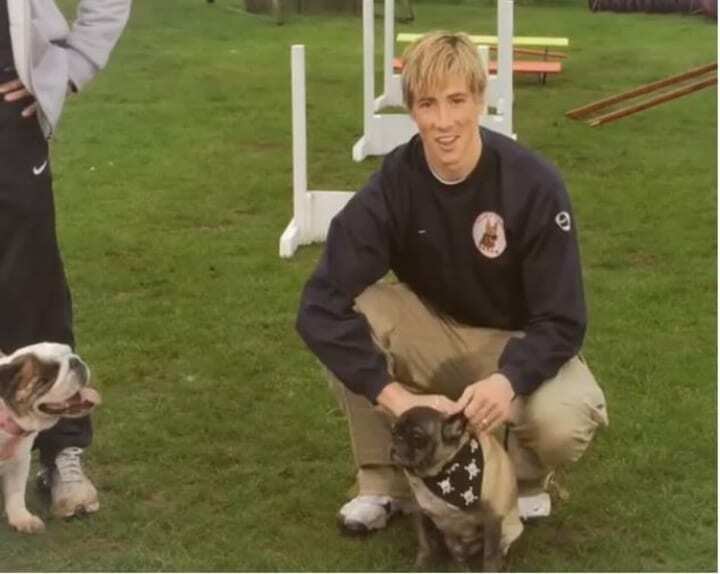 Despite being one of the biggest stars in soccer in 2009, Torres proves that he wouldn’t let the celebrity go to his head, as he helped a friend by appearing in a commercial for his Narub dog school. Everything about this commercial is fantastic. One of the first things that leaps off the screen is Torres’ awful cargo pants, but fortunately the cute pug’s skull and crossbones handkerchief keeps the fashion in check. It’s uncomfortable and awkward from start to finish with Torres looking like he’s cold and ready to go home, but that’s exactly what makes this home video looking masterpiece so timeless. Throughout Wilt Chamberlain’s incredible NBA career there was no one bigger than him on the court, literally and figuratively. 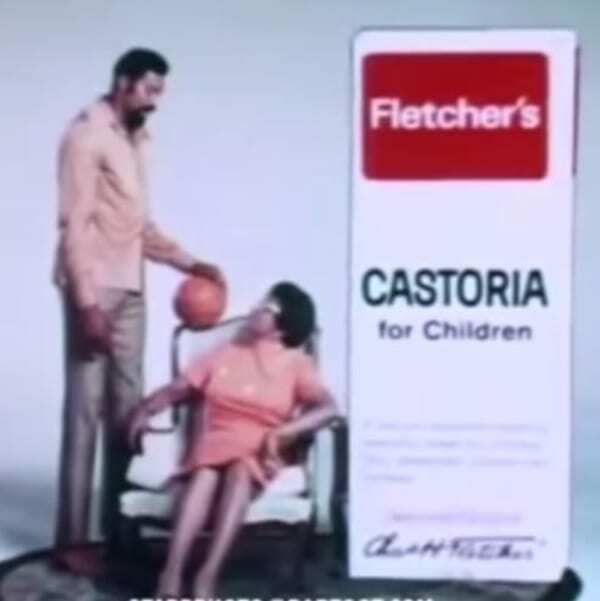 With unrivaled success, any and everyone wanted to slap Wilt the Stilt’s face on the product they were selling and turn it to gold. Of all the things he could’ve endorsed, he chose a laxative. When you’re already pulling off the type of conquests Wilt the Stilt claims to have (wink wink), apparently not even the most embarrassing are that bad. Cristiano Ronaldo is one of the greatest soccer players of all time and richest athletes in the world (not to mention most handsome, SHEESH). 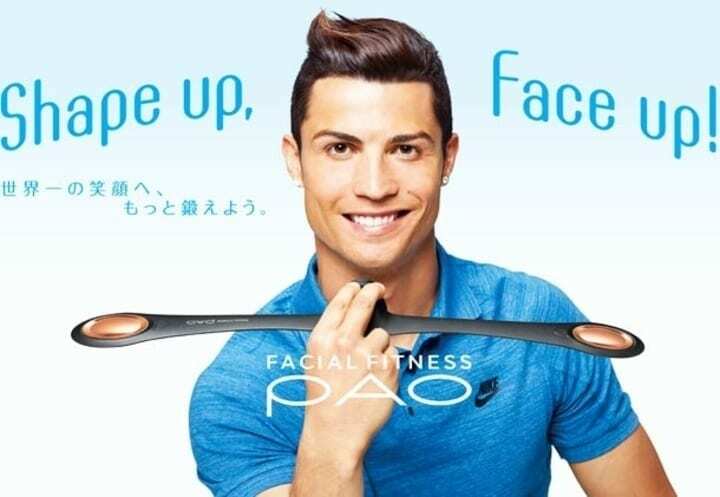 The Japanese product’s called Facial Fitness PAO, and there’s no way it actually does anything other than make the user look ridiculous. The best part of the commercial he appears in is that while an entire group of people are all testing out this mouth version of a Shake Weight, Ronaldo refuses to wiggle that thing around his own mouth. If the person making this commercial had a weirdly specific vision of presenting the most awkward, uncomfortable 30 seconds imaginable, then consider this a total success. Japanese manufacturer Kagome is primarily known for making tomato products. 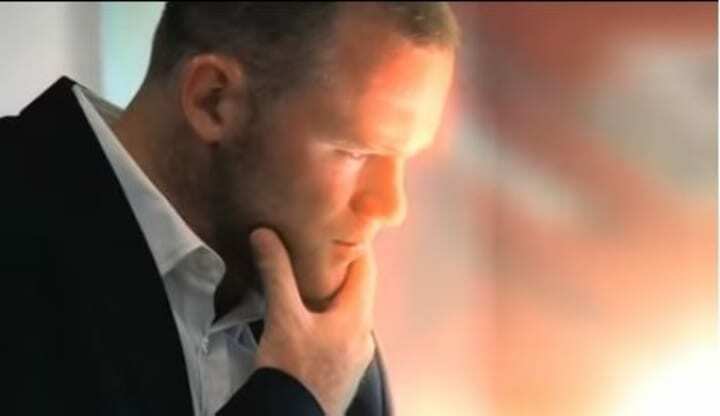 In this commercial, they’re advertising tomato juice with four Manchester United Stars. Rather than do a quick cut to the players taking a sip of the juice, the camera keeps rolling as the players chug away… and keep chugging… and chugging. It’d be one thing if the players looked like they were enjoying the drink, but instead all we get are drawn out shots of these guys choking down medicine they want no part of. Holy handlebar mustache… If something edible is involved, there’s a real good chance Hulk Hogan is endorsing it. 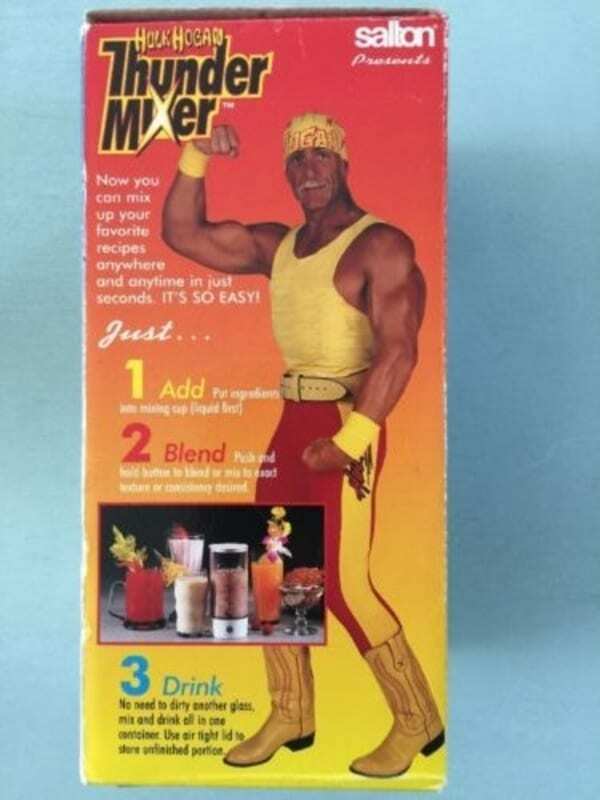 Actually, this failed promotion stings worse than any other product the Hulkster endorsed, as the wrestling great backed this failed product after missing the biggest money-making opportunity of his life. Some really bad communication on Hogan and his people’s part led to him passing on the opportunity to be the face of the wildly successful item known today as the George Foreman Grill. After missing out on raking in millions upon millions, he endorsed a blender that whipped up a healthy serving of regret. There may not be another athlete in the world who can pull off this endorsement other than Tom Brady, and even now it’s as much a running joke as it is a serious endorsement. Tom Brady’s wife, Gisele Bundchen, may be the fashion icon, but the Patriots star quarterback has been the face of UGG boots for years now. 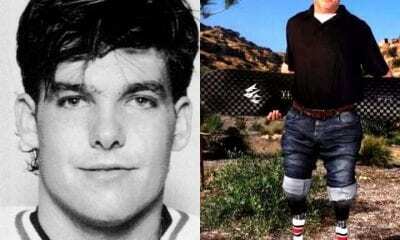 Brady has long gotten his fair share of jokes flung his way for being a brand ambassador of UGG, but he fully embraces it and has actually strung together some hilarious commercials while rocking the furry footwear. They may be known as women’s footwear, but Brady sure does look beautiful in them. 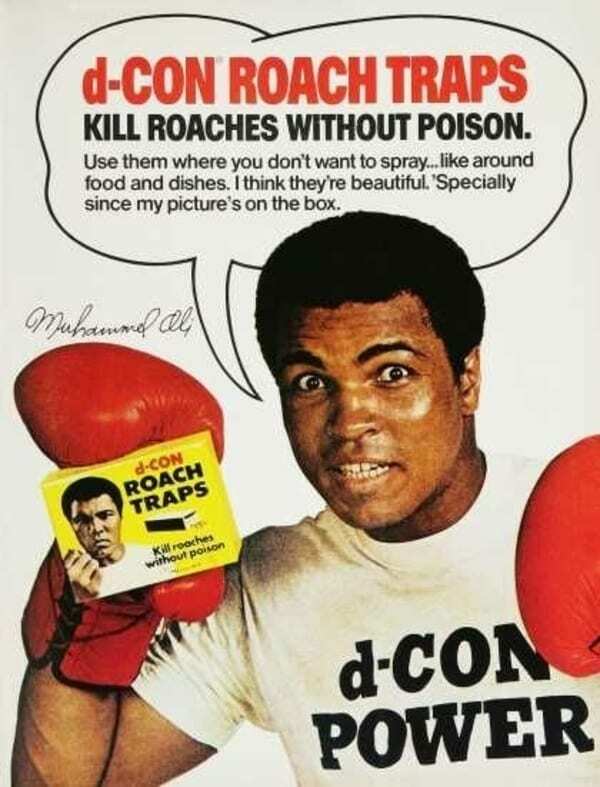 If there’s one thing we can all come together and agree on in this crazy life, it’s that when we think boxing, we think Muhammad Ali, and when we think Muhammad Ali, we think d-CON Roach Traps. Glad we can all agree on that. Seems like a niche market, but you gotta spend money to make money. Overall, there isn’t really anything strange about an athlete promoting a rental car service, but this is a very special case. The infamous OJ Simpson will always be remembered for his murder trial where the glove didn’t fit so they must acquit, and of course the car chase in his white Ford Bronco. The irony is already thick with Simpson being the ambassador of a car company for someone always on the run (yikes), but the company is just too perfect. 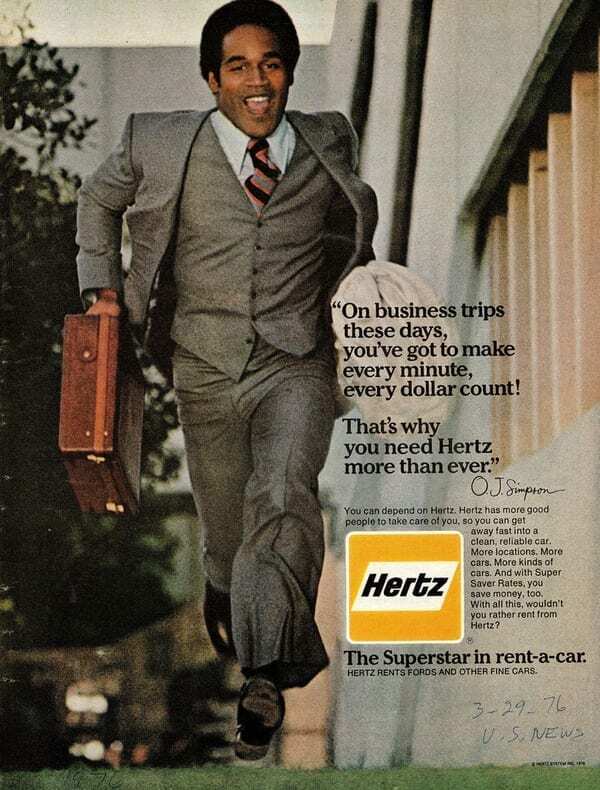 The man who will always be remembered for a police chase, served as the spokesman of Hertz. It’s easy to forget that before all the controversy, The Juice was an incredible running back with a smile that printed money. Everything about this endorsement is flat out baffling. Ric Flair, aka The Nature Boy, has been one of the most recognizable and beloved characters in professional wrestling since the ‘70s, making him an obvious choice to inject some personality into an advertising campaign. That’s still not quite enough to make this a convincing pitch. 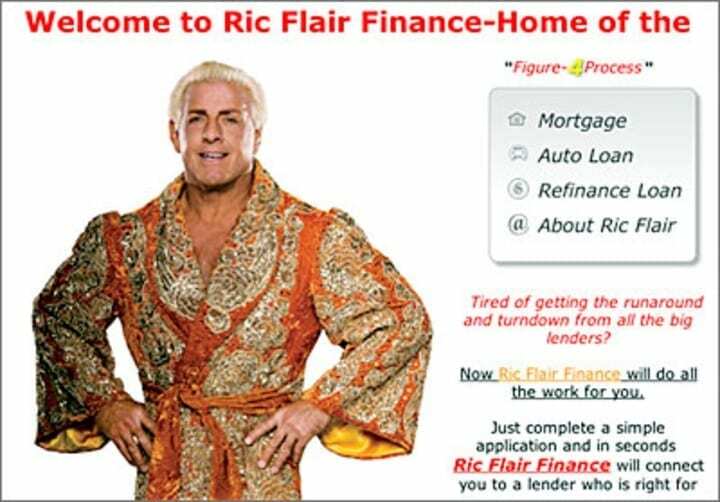 There isn’t a “Woooo!” in the world that’s compelling enough to make Ric Flair Finance sound like a trustworthy financial company. Need to take out a loan? You should go online and get a quote from that jacked guy who wears all those crazy glittery robes! Yeah, not the most surprising thing in the world when the company shut down after about a year. When it comes to getting cozy on a cold night, nothing beats wrapping up in a giant blanket to make a toasty human burrito. The Snuggie cashed in on this with an idea so simple that it’s actually genius: A blanket with sleeves. Now let’s turn this cash cow into a money vacuum. 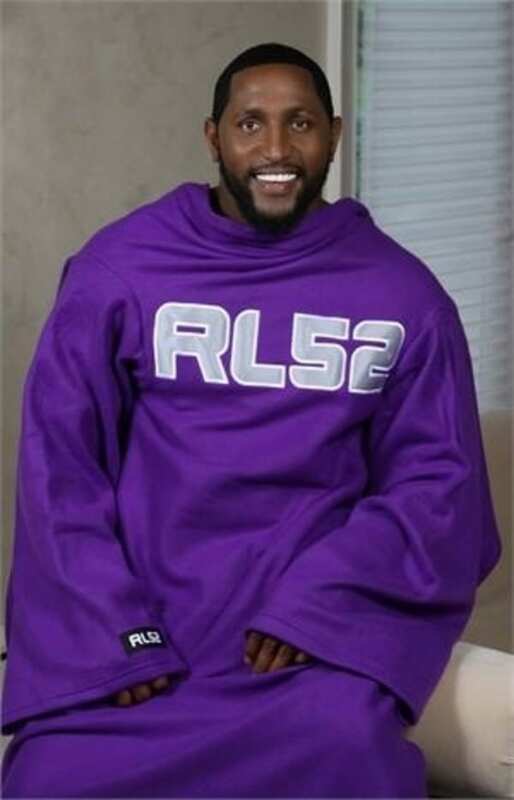 Linebacker Ray Lewis – one of the most terrifying NFL players of all time – decided that his own rip off version of the Snuggie would be the perfect product to add to his clothing line. Lewis dropped his own “blanket with sleeves” that sports Ravens purple and silver colors and his RL52 brand insignia. If this says anything about Lewis’ brand, it’s that he’s got a whole lot of yes-men working for him. Let’s just make it clear, every single thing about this advertisement is fantastic. Despite his relatively brief career fighting, Brock Lesnar is one of the biggest draws in MMA when he’s on the card and his popularity as professional wrestler is even greater. He’s also an avid hunter. What better person to help market Super Charged Scent Killer – a hunting product used to mask human scent – than a man who’s a cold-blooded killer in the ring, octagon and wilderness? 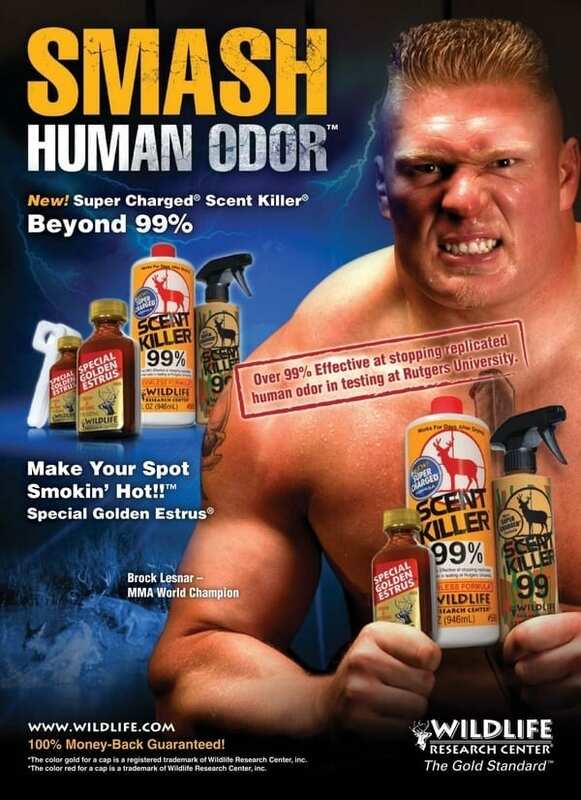 Along with the print ad, Lesnar appears in a commercial for a hot second, but a quick view of him beating a punching bag senseless and screaming to use Super Charged Scent Killer is all we need to buy the product… even if we don’t hunt. Thanks to a grumpy old coach and pretty boy quarterback who knows nothing but winning, the New England Patriots have become one of the most despised teams in all of sports. No matter how much football fans hate the Pats, it’s nearly impossible to say the same about its lovable tight end, Rob Gronkowski. 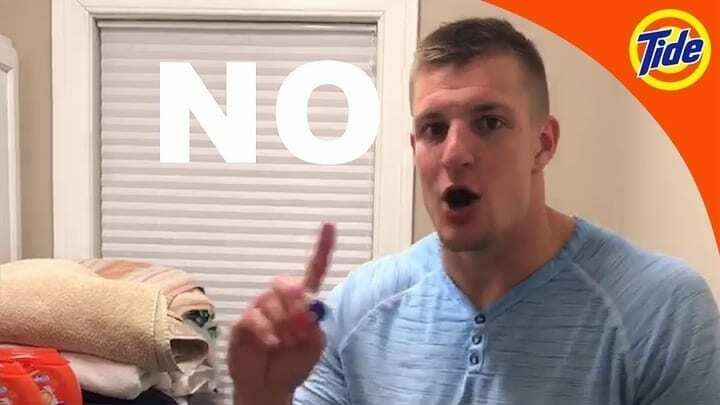 If the Gronk don’t do it, neither do we. He’s like a modern Mikey with Life cereal. 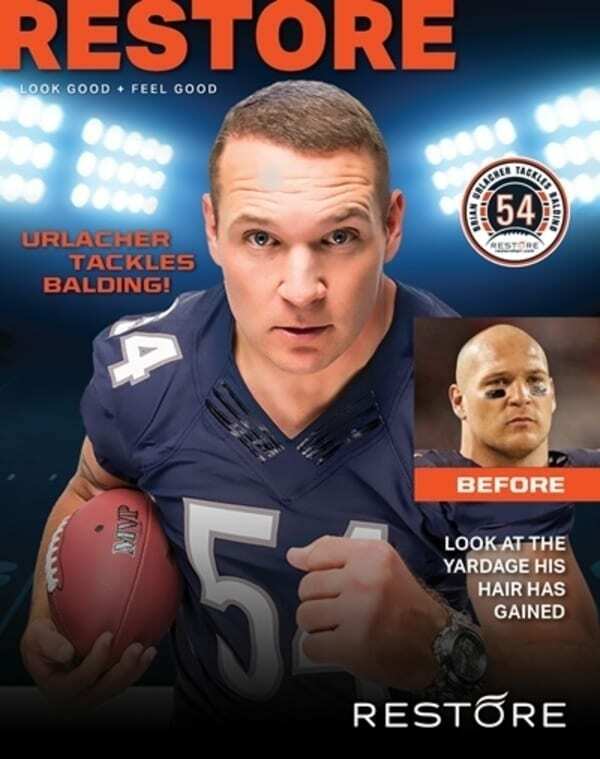 For 13 years, Brian Urlacher was one of the most fearsome linebackers in the NFL. The Hall of Famer spent his entire career with the Chicago Bears and, for almost that entire time, was easily recognized by his shiny Bic’d head. Then we got the shock of our lives when the bad man known for making bald look so boss shows appeared as the face of an advertising campaign for RESTORE Hair. Let’s be clear that there is absolutely nothing wrong with getting hair transplants, seeing a shiny dome we knew so well for over a decade suddenly appear on-screen with a full mop is a real curveball. 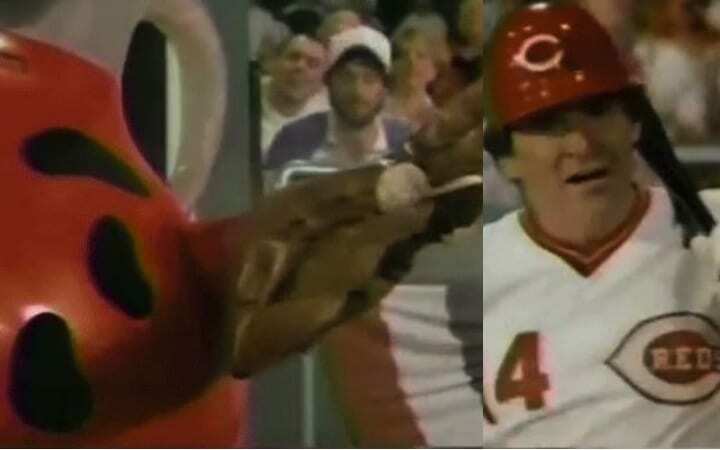 Cincinnati Reds perennial All-Star Pete Rose’s appearance on a Kool-Aid commercial looks like something he promised he would do only if they could shoot the entire thing by the end of the day. For a 30-second commercial, it’s legitimately impressive how many head scratches this evokes. First, we got some kids playing baseball either on Mars or in the desert. Cut to Kool-Aid man running down a highway before blasting through a scoreboard in the outfield to catch a ball Rose cranked for the winning out. Cut back to the desert Mars kids drinking Kool-Aid and Rose walks in to hand the giant drink a baseball, saying “play ball” even though everyone just finished doing exactly. As for the “Kool-Aid for hot kids” motto… Rose’s sketchy past makes that highly questionable, to say the least. Cristiano Ronaldo is considered one of, if not the the greatest player in the history of the most popular sport in the world. That being said, it doesn’t take much imagination to get an idea of how intense Ronaldo’s training and every other aspect of his health regime must be. Seeing even one photo of Ronaldo’s underwear shoots or modeling some other product also makes it clear that the man treats his body like a temple. 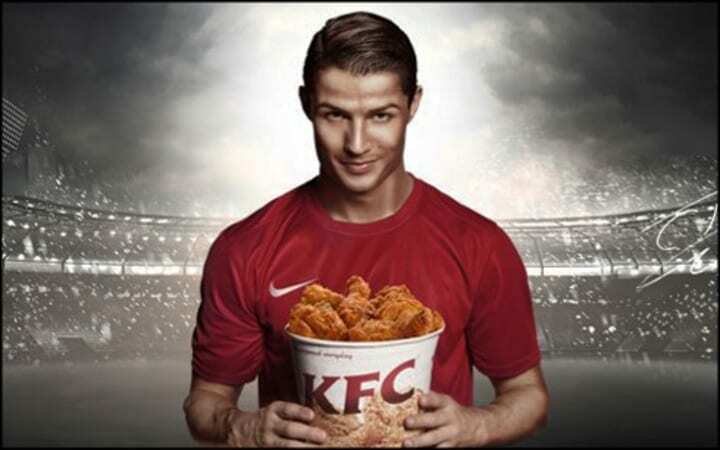 So when the elite athlete appears in advertisements for Kentucky Fried Chicken, we’re going to stick with logic and assume that any bite he took for a commercial is the only fried anything he’s tasted in his life. If this advertisement for Beautymist pantyhose actually helped drive sales, give the person who came up with the commercial a raise and a job for life, because that is a visionary years and years ahead of our time. 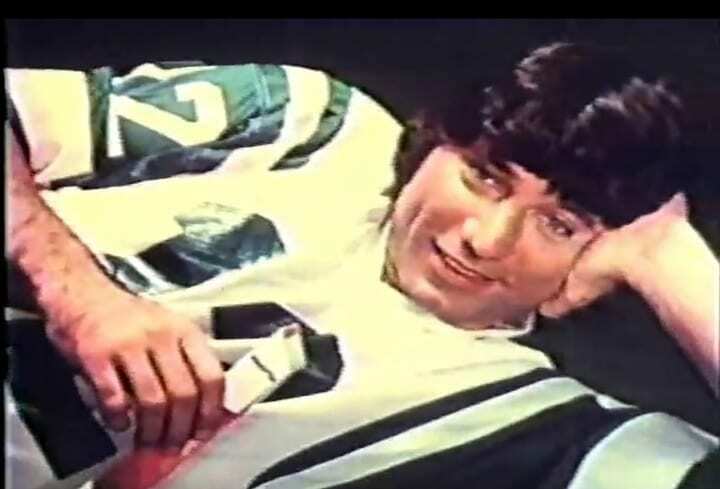 Making New York Jets quarterback Joe Namath the brand ambassador is just confusing. It starts off clever enough, slowly panning from the feet up the long, ladylike legs to reveal… Namath sprawled out smiling. Follow that up with him saying “I don’t wear pantyhose” kind of takes away from the endorsement. Super Bowl-winning quarterback or not, someone saying they don’t use the product feels like somewhat of a wasted opportunity. Michael Jordan has been a brand ambassador for Hanes for years and years. There’s nothing weird about supporting some comfy clothes, but there is one particular commercial that raises a giant red flag. MJ is flying first class, sitting next to a chatty weirdo who’s talking about messed up collars, but that’s all blah blah blah. It’s nearly impossible to process a single word any of them are saying, because what is Jordan doing with his face?! Not even the GOAT should have the sort of confidence needed to try and pull off a very certain mustache that everyone relates to a very certain someone. Jordan needs to stop looking at the dude next to him like he’s a weirdo and look in the mirror to see what’s wrong with his style. Weight Watchers decided to make the always outspoken NBA Hall of Famer Charles Barkley the face of an ad campaign, which was a fun idea since even as a player his weight earned him the nickname The Round Mound of Rebound. Still, everything about this advert is weird. Barkley is dressed up in a dress and heels, wearing a wig and all sorts of feminine accessories. Okay, that’s fine. He’s “grabbing our attention.” Barkley made this weird gimmick worse when he was caught on camera saying that Weight Watchers is a scam, but knowing Barkley and his reputation for always talking trash, this may as well have been a part of the contract. Shawn Johnson and two other Olympic gymnasts came together to make one of the more random advertisements athletes have ever been offered. Olympians essentially make nothing for competing, so it’s important that they cash in on any success as soon as possible. That’s where Ortega comes in. Ortega could not have promoted their Mexican food products any more awkwardly than they did. “My taco is the best. I love Ortega taco sauce. It makes my taco pop.” Are we being immature by reacting to these lines? Without a doubt. Are Johnson’s lines still worded to sound as inappropriate as possible? Absolutely. In 2012 another Japanese company was coming in hot with an athlete endorsement of a product that looks as ridiculous as the celebrity is famous. Any soccer fan who isn’t a Cristiano Ronaldo supporter will likely argue that Lionel Messi is the greatest player in the world, so it’s safe to say that Scalp D Face Wash landing Messi for the advert was a big win. That being said, not even the greatest player in the world can make this facewash look any less ridiculous. 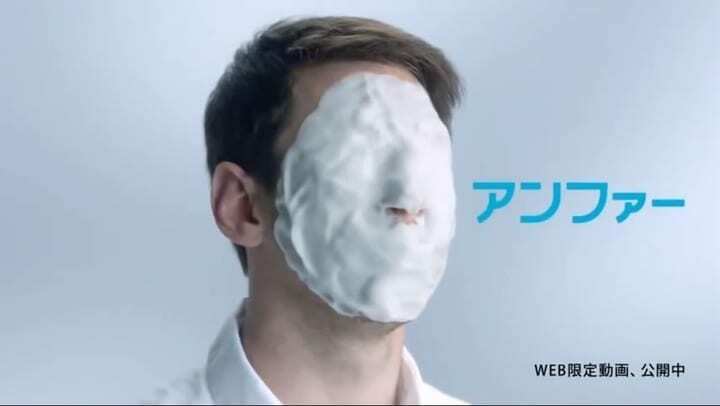 After Messi splashes off this facemask, he busts out a little Japanese, which is probably very cool to hear the mega-celeb speaking the native tongue. Well, that would be the case if the hilarious image Messi being suffocated by a Plaster of Paris-looking mask. Spending an ungodly amount on an athlete whose face is concealed for most of the commercial is an iffy move. 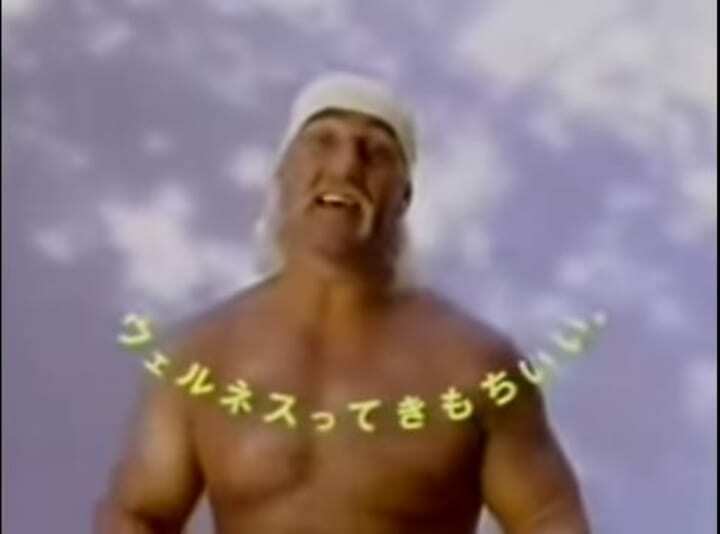 There’s something very off-putting about this commercial, and by “something” we really mean “everything.” Hulk Hogan isn’t just the most popular professional wrestler, he’s the living embodiment of wrestling. Seeing what’s supposed to be the baddest man on the planet singing a lullaby that isn’t even a lullaby just gives us the creeps. First off, worst lyrics in the world. Second, is the Hulkster trying to claim there are two Thursdays in a week? Third, how is this commercial supposed to be an advertisement for Hitachi Bigflow Air Conditioner? One of boxing’s most decorated competitors, Manny Pacquiao is the pride and joy of the Philippines. Pacquiao’s celebrity amongst Filipinos has transcended “regular” fame and fortune. He’s become so popular that there’s a very strong chance he may be the next president of the Philippines. In other words, slapping his face on a product means business is about to be booming. Of all the things the star boxer could have appeared in, Pacquiao and his mom teamed up with Datu Puti to advertise soy sauce and vinegar. 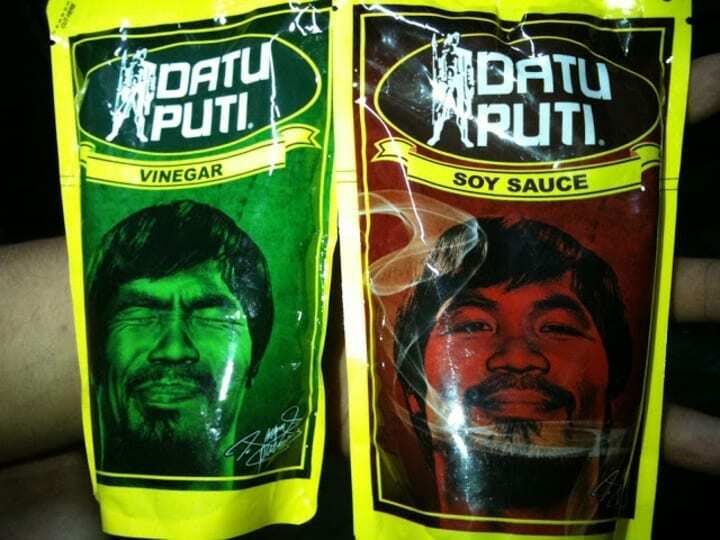 When walking through the grocery store and trying to find the perfect condiments, nothing gets the mouth watering like seeing Pacquiao’s face on a pouch. Easy decision. Also… a pouch for soy sauce and vinegar? Seems like the serving size might be a bit on the large side. Players melodramatically taking dives and screaming out in pain from the phantom injury they received has always been a black mark on soccer. The terrible attempts at recreating authentic agony apparently spreads to normal acting off the pitch too, because this Manchester United trio put on an awful performance in this win commercial. Even if Wayne Rooney, Ryan Giggs of Patrice Evra put on the performance of a lifetime, it’s still pretty hard to buy into Wayne Rooney & Co. wanting to “indulge” on Casillero del Diablo, a bottle of wine that costs somewhere in the range of $8 to $12. Quarterback Vince Young was never quite able to replicate his success at the NFL level that he found in college. 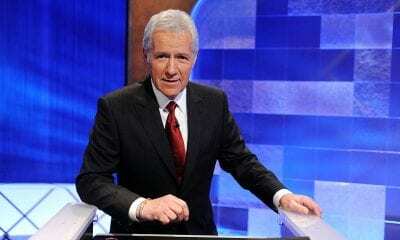 Still, his NCAA career with the Texas Longhorns, capped off by an all-time classic national championship (2005), is more than enough to make him a football legend. Young capitalized by setting up a steakhouse in Austin, which has enjoyed a great deal of success. His line of food products on the other hand, ehhhh not so much. 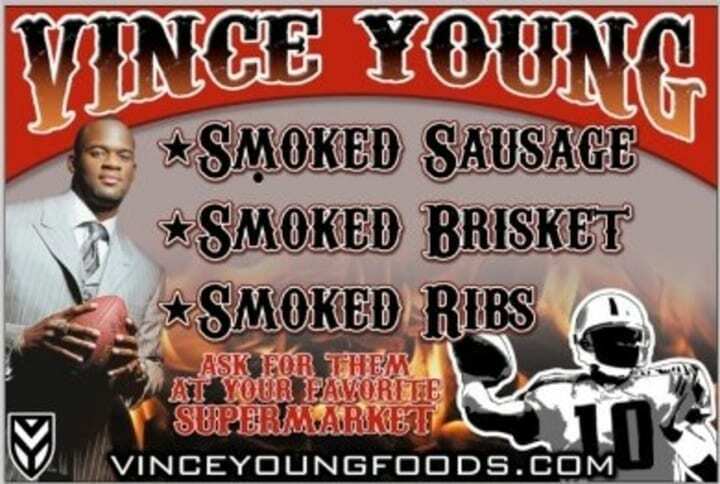 Vince Young Foods was a failed attempt at dishing out some processed meats that didn’t pass the taste test. At least the bootleg packaging, remains consistent by not passing the eye test. By far one of the most entertaining commercials an athlete has done, San Diego Padres pitcher Akinori Otsuka nailed the art of the random endorsement. Otsuka is featured in a local ad for Corky’s Pest Control, and there’s no lame attempt at making it into something more grandiose. Ants come in and totally ruin Otsuka’s picnic of one. The fact that Otsuka set up his own picnic and was ready to crush an entire table of food was already impressive, but when the ants roll in, he goes to war and smashes those savages with a bat. Corky’s comes in to save the day. Boom, problem solved. We believe in Corky. Hulk Hogan has endorsed a LOT of products, each one seemingly more random and obscure than the next. This concept was set up for failure from the start. 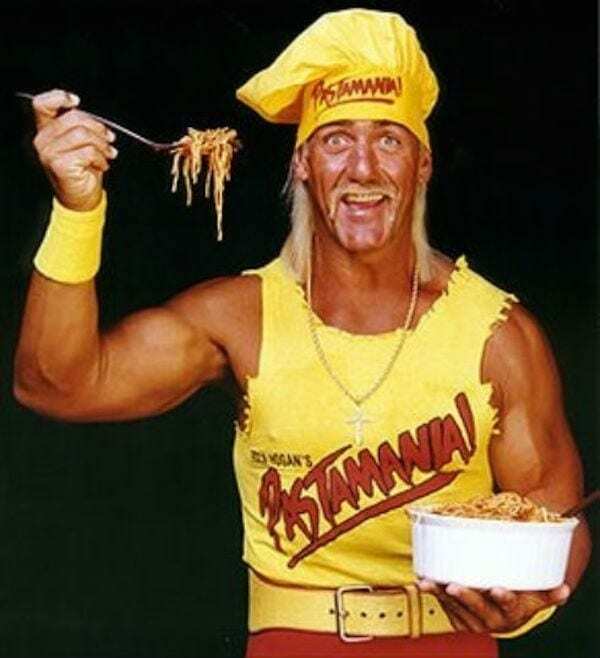 Hogan’s Pastamania was a haphazardly thrown together restaurant adventure that crashed and burned fast. Pastamania was opened in Minnesota’s Mall of America in 1995. Gimmicky dishes that found ways to put “Hulk” in the name without really giving any idea of what the actual dish is pretty much made up the entire menu. Not even Hulk’s celebrity could keep this terrible idea afloat. Pastamania didn’t even make it a full year before it closed its doors. RJ Young is an IT company based out of Nashville, operating as an office technology dealership. The Tennessee business didn’t look far to grab a familiar name to promote the business, bringing Titans Pro Bowl kicker Rob Bironas on to star in a commercial. 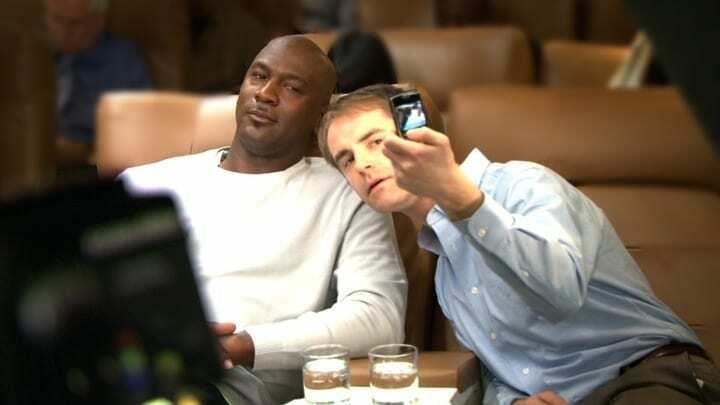 Bironas took part in a commercial that is truly local television advertising at its finest. A group of office workers stand around a broken copier, slamming it around to fix it. Enter Bironas: Savior of random office workers. Bironas delivers a massive punt, blasting it through the 20th story window (reasonable). Everyone celebrates. Bironas chokes a guy quick saying they should’ve called the copier pros. Day is saved. Ben Roethlisberger saw dollar signs in one of the more obscure product endorsements imaginable: beef jerky. Big Ben’s Beef Jerky sounds like an awesome old timey, local brand of beefy goodness. While it actually is made locally in Pittsburgh, seeing Roethlisberger’s goofy face doesn’t really feel like it’d drive sales of such a specific product. There are two very different sides to this. On the one hand, maybe fans see Big Ben on the cover and imagine this jerky must be so good that’s why he’s such a hefty QB. On the other hand, the big “low in fat” labeling suggests putting his face on the bag is the closest he got to touching this cheap gimmick. 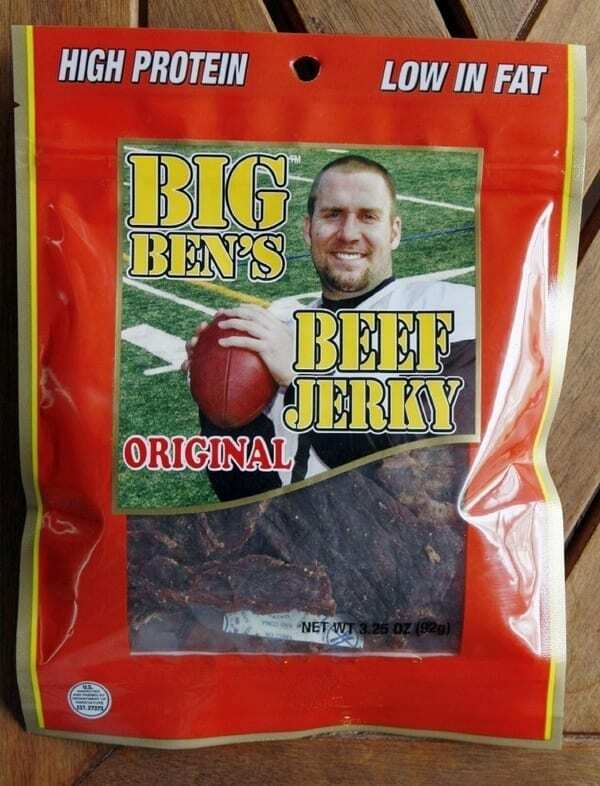 Either way, when a certain controversy followed Roethlisberger in 2010, Big Ben lost his jerky sponsor. The range of products athletes have endorsed is all over the place, but former soccer star Michael Owen has topped them with this one. Even from a man who’s endorsed everything from whiskey to pizza to watches, nothing could’ve prepared the retired striker from endorsing… Dubai tourism? Owen is the only person featured in a 10-minute advertisement in which he played the role of a helicopter flying us around on a tour to show all the amazing attractions Dubai has to offer. The final result is a deadpan voice awkwardly reading – there are parts that literally feel like we’re watching Owen read his script – a monologue that never ends. What’s he saying? Who knows, he lost us about 30 seconds in.